This is a great help when you have intially broken down the script and want to sort by location etc. to start planning your shoot and group similar scenes together. Once the shoot is underway it also provides a quick way for you to identify scenes that may need to be rescheduled when a problem occurs, such as losing a certain actor due to illness or injury. To set the filter you enter “Edit” mode, and select one or more strips. Now tap the new “Filter” button that appears at the top left of the menu bar. 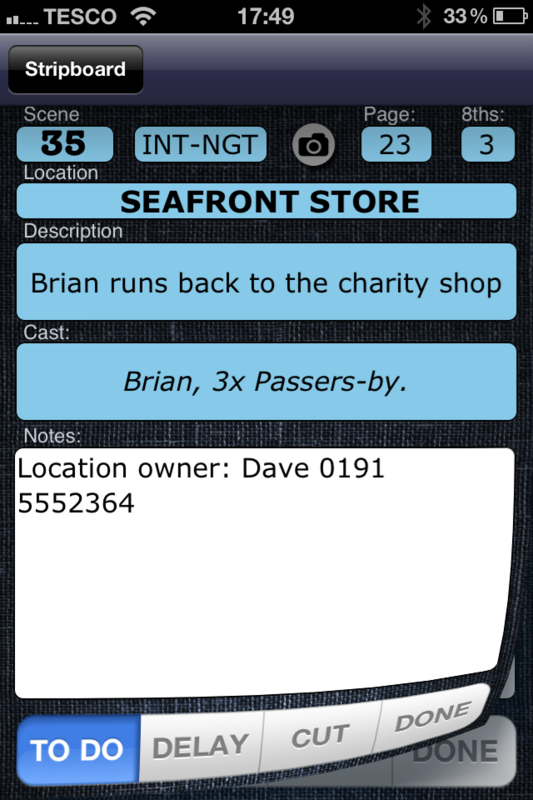 This brings up a screen that lists all your cast members, locations, times of day and settings for your project. Set checkmarks to select items. If you select more than one location, the filter will select scenes at ANY of the selected locations. The same goes for time of day, and setting. The filter works slightly differently for characters. If you set more than one character, the filter will only select scenes with ALL of the selected characters. To find “All scenes that involve your lead actor at night”, you would set the checkmark for your lead actor in the character list and “Night” in the times of day list, and would leave all other parameters unset. To find “All scenes with your star and co-star together” you would set the checkmark for your lead actor and co-star in the character list, and would leave all other parameters unset. TIP If you need to filter scenes with no characters, create a “no-one” character and add it to any scenes with no cast. You can then filter for that.To find “All daytime scenes at the BEACH or BEACHHOUSE locations” you would set the checkmarks for BEACH and BEACHHOUSE in the locations list, and DAY in the times of day list, and would leave all other parameters unset. To see the result, tap the “Stripboard” button to return to the stripboard. Any strips that match the filter will be selected, and the menu bar will tell you how many strips that is. You can now move or duplicate the scenes , or can manually add or remove strips from the selection by tapping the strips. This update also fixes two known crashes in the previous version, one when deleting a project, and the other when aborting the delete of a storyboard frame on iPad. I liked it when the location and description were aligned. Now both appear to have moved, giving room for the actor names. But honestly now it just looks messy. Please update the look or revert back to where everything was aligned properly. A number of users working on projects with larger casts really needed cast names, rather than numbers, and this seemed a worthwhile compromise. The current alignment is to fit as much in as possible. Is your request purely aesthetics, or actually font size that is your issue?, and are you on iPhone or iPad? I’ll see what I can do in the next update. I’m on the iPhone 4 and yes I like the previous version because of the aesthetics. Also, Could you make it possible to add a google maps feature to Shotlist. I’d really like to be able to have a pin or marker on google maps of where the scene will be shot. That way everyone can meet at that location. There are many directions we could develop ShotList (no pun intended), and this is the first request we’ve had for this, though I do like it. Could anyone interested in this feature drop me a line on shotlist@solubleapps.com so we can assess demand against other requests. Please include how you would need to define the location (probably start with address/postcode, or select another location, then move a pin on a map?) This would probably need to be included on the location selector page, as space elsewhere is limited- especially on iPhone, and it makes sense for a location name to link to a map location so that all scenes with the same location name are set and moved together. Should you see the positions of all other defined locations at the same time, or just your current position and that of the location in question? Any suggestions will be incorporated if we add this feature in a future update. Since I shoot mostly in remote locations, such as in the woods or desert, i might not have an address. This is where having a google maps feature with my saved locations for each scene would be an awesome help. I really hope there is high demand for this feature. Also I have an app called Panascout, where whenever I take a photo it saves my gps location on google maps. I think it would be cool if I could as a director go location scouting, snap photos of the locations for each scene, and have those photos automatically saved on google maps as pins in the Shotlist app. I’d also be willing to pay more for this feature. Previous Previous post: How “FAQ” Helps You Communicate.